The Alakai Swamp is the world’s highest, resting at 4,000 feet—situated between the top of Waimea Canyon and the upper lip to the Napali coast at Kalalau Valley, and at the backside of Mount Waialeale, the wettest spot on earth. Talk about a sense of place! Before the miles-long boardwalk was put in—a fanciful array of staircases and ramps—venturing into Alakai was life threatening. Dense tropical flora, whiteout fog, and heavy rain and cold temperatures combined for a knockout punch to anyone who wandered from the trail. The boardwalk is now a lifeline and an opportunity for hearty hikers to venture into a remarkable complex and beautiful tropical garden. 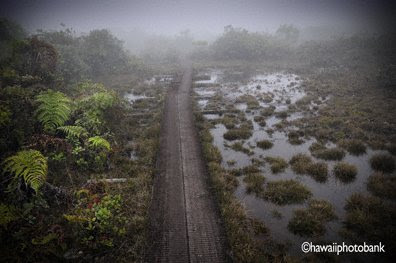 The best trail, the Pihea, begins at the edge of the Kalalau (see Feb. 5 of this blogspot), traverses the swamp with a 400-foot down-and-up stream crossing and, (gee, forgot this part), ends at the Kilohana Overlook—a platform perched at the edge of the 4,000-foot-high Wainiha Pali with a view down to Hanalei Bay. You need to catch the right day to see the view. But, even with all of its scenic neighbors, Alakai Swamp is an otherworld unto itself, so if you find yourself on this boardwalk, make sure to pause frequently and let this place sink in. Just don't wander from the boardwalk and sink into this place.